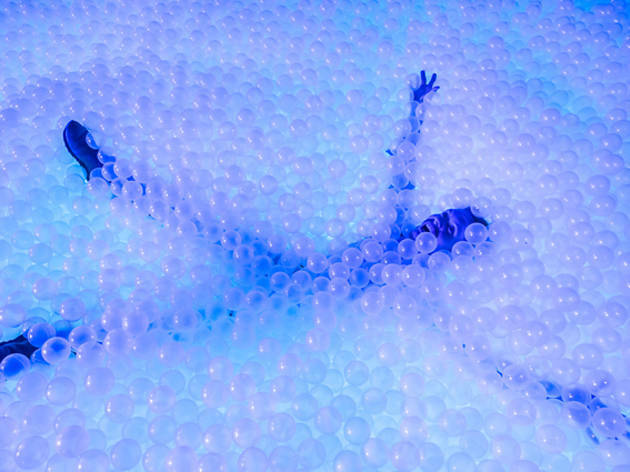 As if BallieBallerson, London's adults-only ball pit bar, wasn't bonkers enough, the giant ball pit has now been given a glowing makeover. The ball pit is now UV lit and lined with mirrors – and the multi-coloured balls have been replaced by 250,000 clear balls, which will be lit up by 10,000 LED lights underneath, which pulse in time with the music. So, naturally, it's been renamed GlowyMcGlow. And if you thought all that sounds a bit mad, wait until you hear about the space-themed cocktails they've been cooking up. There's the Neptune, based on charcoal and liquid nitrogen, the helium-rich Saturn that's garnished with a floating balloon, and, um, Uranus, which comes with a 'miracle berry pill', whatever that is. Remember those birthday parties at soft play centres you used to go to as a kid? It'll basically be like that, but with booze. And flashing lights, obviously. Ready to jump into the ball pit? We've got an exclusive offer, with tickets for just £10. Book yours here. Find more kidult fun in London. BallieBallerson GlowMcGlow have recently rebranded themselves with new clear balls 250k in fact that change colour due to the LED lighting under the 10k floor that pulsate in time with the DJ spinning out funk and ragged house music. This was my first ever time in an adult ball pit and I do mean ever and boy I loved it. Forget about swimming in water go and try and swim in a ball pit instead. You can have so much fun with the balls from jumping into them whichever way you desire, try to swim in them, walk or should I say hike in them, hide amongst the balls, dance, juggle with a ball or two, play with them, throw them around or why its winter try and do a perhaps a ‘Ball (snow) Angel’ move. BallieBallerson also sells unique cocktails with them all being named after planets. I especially loved the the cocktail Saturn which did not just taste good but also came with added fun a helium balloon, Pluto that is bedazzled with glitter and then I loved the look of Mars that is set on fire. There are so many unique cocktails all with fun elements to choose from with them costing around £10 each. The cocktail bar is also fun with it’s plasma balls hanging above and the glow in the dark murals that are charged with UV light and the cocktail men are lush too. This place is most definitely fantastic for a mini party celebration or just for a pure fun get together. An adults only ball pit with alcohol is 100% my thing but throw in UV lights, balls lit up by an LED dancefloor and planet themed cocktails.... 110% up my street and racing to be the first to try it out... luckily I got to experience it before its official opening (this Friday) and was thoroughly impressed by the concept, the friendly staff, the insane drinks and ALL THE BALLS!!! A 10 minute walk from Dalston Kingsland, BallieBallerson is easy to spot.... due to the wall full of LED balls in. It covers two floors with the bar on the ground floor surrounded by neon painted walls and psychedelic lights (memorising) and the ball pit in the basement. If you see a space at the bar make sure you get in quick as the cocktail menu is gonna be popular! The planet themed cocktails are awesome with my top recommendations being Neptune and Uranus. The former a blueberry, sugary spirit concoction topped with cream that they turn to ice cream in front of your very eyes (liquid nitrogen is involved!) and the latter a super sour mix that requires you popping your very own pill to turn your tastebuds on their head (I also managed to eat a whole lemon wedge without wincing after...W-T-F). The ball pit itself is much bigger than I thought with over 250000 balls. There is a DJ booth at the back and a cloakroom for all your valuables just before you enter. It was an absolute blast diving in and jumping around like a hooligan. Fuelled by the alcohol and a sugar rush along with the pumping music, my friend and I had a great time. This place is a must and would be fantastic for a birthday night out! BallieBallerson GlowMcGlow I went along to their press night to celebrate their new ball pit which was balltastic. They have recently rebranded themselves with new clear balls 250k in fact that change colour due to the LED lighting under the 10k floor that pulsate in time with the DJ spinning out funk and ragged house music. This was my first ever time in an adult ball pit and I do mean ever and boy I loved it. Forget about swimming in water go and try and swim in a ball pit instead. You can have so much fun with the balls from jumping into them whichever way you desire, try to swim in them, walk or should I say hike in them, hide amongst the balls, dance, juggle with a ball or two, play with them, throw them around or why its winter try and do a perhaps a ‘Ball (snow) Angel’ move.